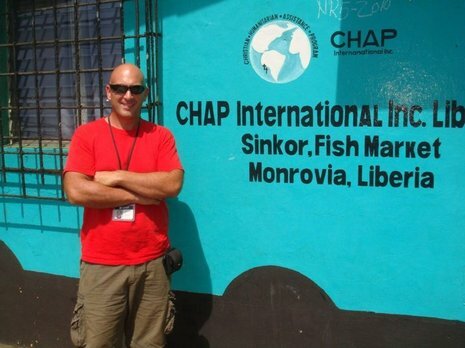 CHAP International's inception began in February of 2002, when Founder Stan Weaver visited Liberia, West Africa on a mission trip. Stan's world was flipped upside down as he experienced Liberia, during the war, in its toughest times. There were a myriad of touching experiences during this trip, and after returning to the U.S., he could not stop reflecting upon them. He knew his life had been forever changed. Stan began sending funds to Liberia for distribution to the Liberian people. Through these funds and communications, a team of people, including CHAP Board Member Sackie Kwalalon, formed a non-profit for the purpose of providing ongoing humanitarian aid. This team was the beginning of Christian Humanitarian Assistance Program – CHAP International. In September 2004, Stan took a group from the U.S. to Liberia to distribute food and clothing, while further assessing the needs of the nation. This was a pivotal trip for the organization as CHAP filed official paperwork and became a non-governmental organization (NGO) in Liberia, acquired duty-free status, established financial accounts and even found an office building from which to base their future operations in Liberia. ​Today, we continue to meet the needs of the Liberian people through our humanitarian programs. Stan's passion and desire to be the hands and feet of Jesus in Liberia still rings true today. We strive to live out our mission to "Do right & seek justice."